Well this week it has been pretty much impossible to miss BBC Britpop week and you know what? It's been excellent, particularly on the radio, and I've especially enjoyed the revived evening session with Jo Whiley and Steve Lamacq. I ever broke my personal vow of never listening to BBC Radio 2 in order to participate. 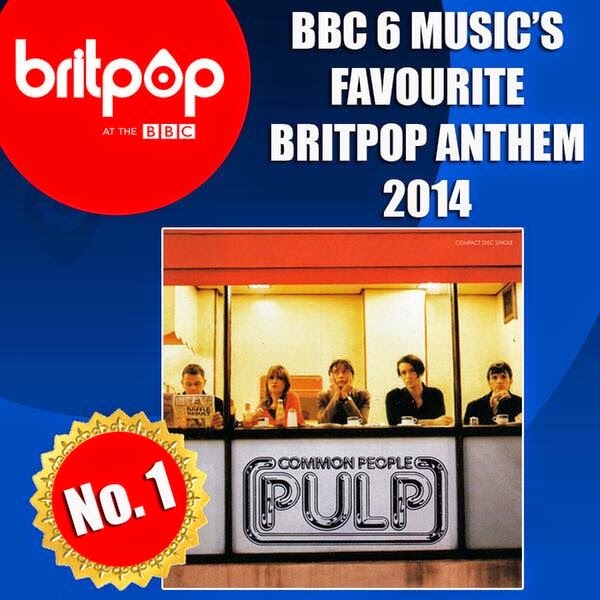 The centerpiece of their scheduling was a public vote to find the Top 40 'Britpop Anthems'. Now of course any chart is subjective but with such a large voting base (over 30,000 people took part) things average out don't they? The big hits float to the top and it all becomes a bit predictable. Except I don't think it was. Yes, most of the Top 10 are probably the ones you'd expect and Common People is a worthy winner, but look further down the chart and there some refreshingly interesting and slightly obscure choices; Salad, Strangelove, Powder and Denim. Denim, good grief! And My Life Story at Number 17? These 30,000 people know their Britpop.